Here is a selection of things we have been up to in the last months. 1. We will have a new curate, Vlada, who will be with us from the summer. 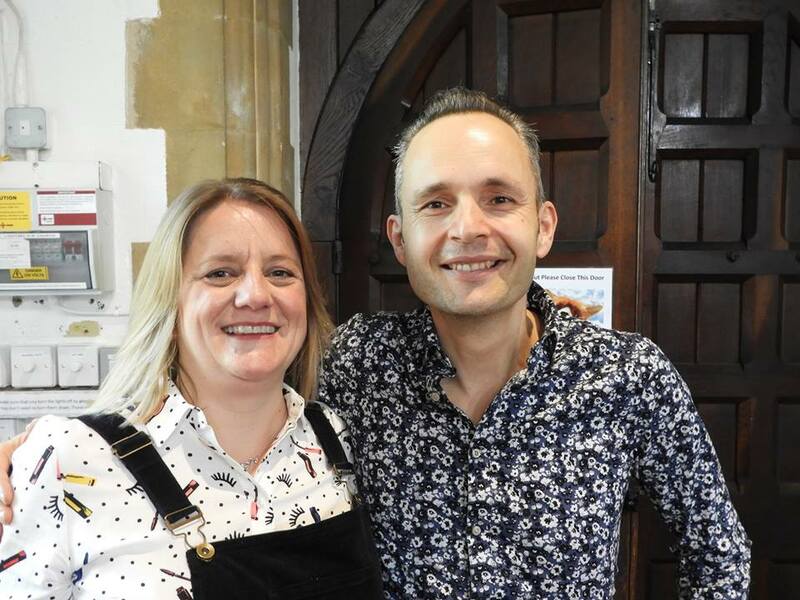 A full time hospital chaplain Vlada lives in Nork with his family and he will be with us on alternating Sundays and on an ad hoc basis during the week. We look forward to welcoming him to our church family. 2. The diocese generously encouraged us to use the funds we have to invest in our church and our future. We have already done this with the screens and the lighting, and we have ring fenced some of our reserves to match fund a grant we are hoping to receive to improve our sound system. After discussions with the diocese we have made a free will offering of £6,500 to the Bishop’s Mission Fund. The diocese has in turn forgiven us our £65,000 debt. This is amazing news. 3. On April 23rd our new youth café launches, and we are really excited to see how that develops and increases our contact with young people in our local area. Please do pray for the team who will be running that new outreach. If you want to read the full APCM 2019 report you can find it here. Our commitment this year is to reach out into our local community and get more actively involved. Our first opportunity to do that as a church is on Sunday 10th March at Epsom RDA (Riding for the Disabled). As you know they suffered a break in last year and some of their horses were injured. One had to be put down around the time of the attack and one just a couple of weeks ago as they were not recovering from the attack. The RDA have been given funding for some privet hedging to help improve the security on the site. We have been asked if we can help plant it. We will be doing it on Sunday 10th March at 2pm and if we get a good turnout we will be all done by 4pm. 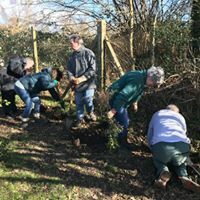 Epsom RDA will provide tea and cake, you just need to bring gloves, a trowel and a spade if you have one. Advanced gardening knowledge is not required, just a willingness to help. If you can commit to being part of the team with me please can you let me know. 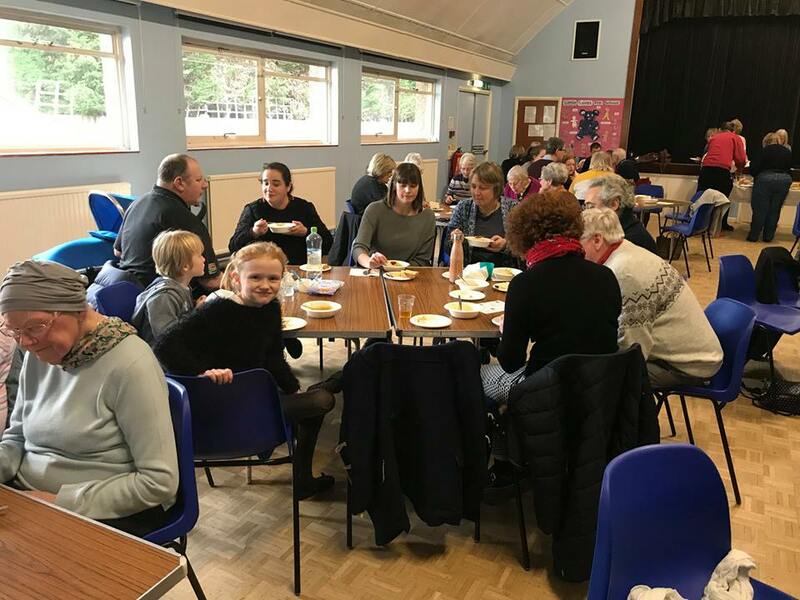 We had a fantastic morning worshipping God, celebrating our new 2-year vision plan, showing our commitment to working together and eating soup and lots of cheese. Please see the Vision 2020 page for more details and photos. We certainly learnt to walk in love and obedience during 2018 as we had to trust God through the drains saga and love one another through more challenges, illness and loss. Through it all though we, as a church, grew ever closer to God and continue to deepen our relationships with Him and with one another. January – saw the launch of our Seeker course with over 20 people attending across the six weeks and much excellent discussion and asking of hard questions. Dave Senneck, Cathy Cattermole and Lyn Oakley all began the Growing Leaders course, Janet and Sue went on a LYCIG (Leading Your Church Into Growth) residential and you all pitched in and did an amazing job at our ‘Service of Serving’. February – the building works continued in the Webber Hall with the installation of the toilet and the decoration works. Lent began with an Ash Wednesday service and the launch of our ‘Collection Potty’ for Toilet Twinning. In the end £540 was raised and we were able to twin all of our toilets and two extra ones! March – Janet arranged a Lenten quiet day and Sue and Janet took part in Easter Experience at Danetree school. 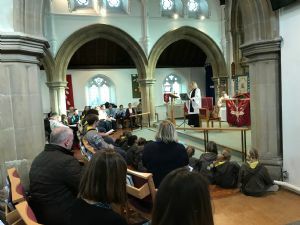 We hosted an excellent play ‘Where Adventure Begins’ and many of us were challenged to think about how we include and disciple young people in the church. 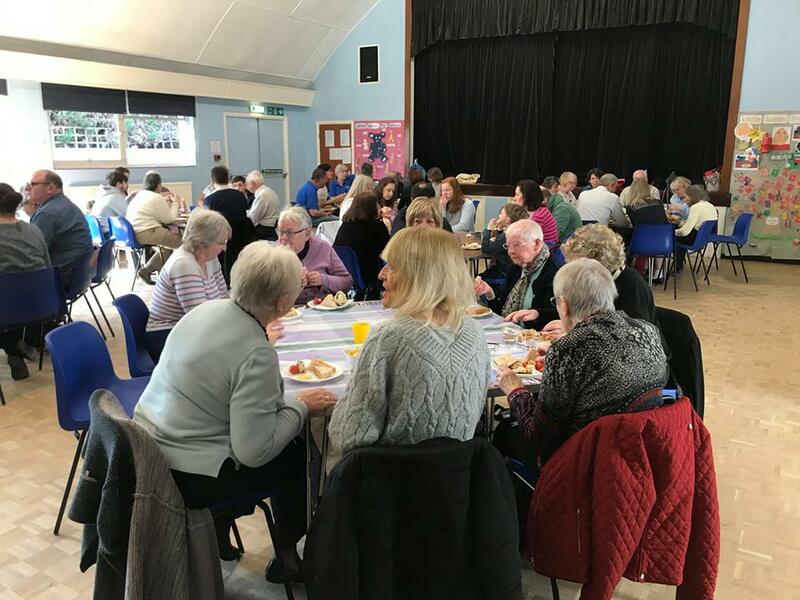 We had our APCM dinner and games night which was really well attended, and the month ended with our new screens being installed in church whilst a Maundy Thursday meal was enjoyed by over 60 people in the hall. The following day we had a really fun and busy Easter Workshop followed by an ‘Hour Before the Cross’, meditating on paintings relating to the events of Holy Week. 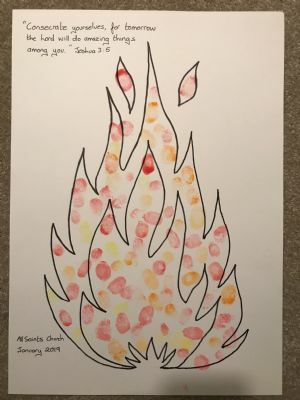 April – began with an early start for our sunrise service on Easter Sunday, we gathered outside on the meadow around a fire for communion and then enjoyed breakfast together in the hall. The exciting event in April was the launch of Honeycomb Café which has gone from strength to strength. I am so thankful to Fiona for her passion and enthusiasm for building community and her incredible baking skills too. The month ended with a visit from Revd Wes Sutton from the Acorn Christian Centre and he spoke at our morning service and then commissioned our prayer ministry team. May – we had a day of prayer with a range of different activities as part of the ‘Thy Kingdom Come’ national initiative. The youth were also working hard to promote Foodbank and arranging a collection of items for them. I can still remember their brilliant, amended version of ‘Amazing Grace’. In total over 111kg of items was collected and donated. June – the Mothers Union hosted a talk on ‘Human Trafficking and Modern Slavery’, it was enlightening and thought provoking and really well attended. The end of June saw the last of our ‘Tea & Harmony’ events. I am so grateful to all the team who worked so hard to put on those events over many years. July – was a very busy month. Our new men’s ministry headed by Robert Bourne began and they have enjoyed meals, walks, and pub nights. 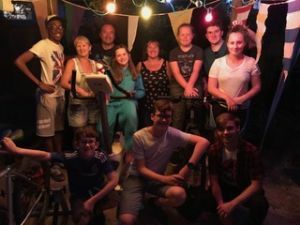 The youth held the ‘Great All Saints Bike Off’ and pedalled continuously for 24 hours. God blessed us with a sunny and warm day and night and incredible youth leaders who sat up with the young people and took several turns at pedalling themselves. It was an incredible achievement and thank you to all who supported this event. As the Bike Off ended our summer special began and the meadow was filled with people for our service, a picnic and then fun on the bouncy castle. New chairs were bought for the hall and the process of upgrading all the lights in church and the hall began. August - traditionally a quieter month our lighting works continued, and they have made a real difference to the quality of light in church and both halls. 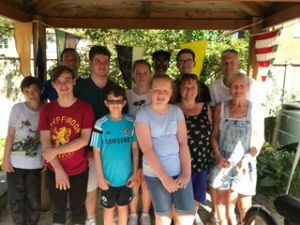 The end of the month also brought the news that the drainage works had been connected to the wrong waste water system and thus began months of prayer, discussions and works and the temporary closure of Honeycomb Café. New connections were eventually completed in January 2019 and the works officially signed off in February 2019. September – we launched our own LYCIG course, thank you so much to all those who came and engaged with that each week. Your input, insight, enthusiasm and support were such an encouragement to me and so very helpful as our next vision plan was prepared. It was so positive to see so many people wanting to engage with growing our church. We also held our second ‘Hog Roast & Beer Festival’. Even more popular than the first one, the hall was packed, and great food and many drinks were enjoyed. October – the main event of this month was the youth weekend away to Carroty Wood. A weekend of fun, adventure, pushing ourselves and achieving more than we thought we could. Such a valuable experience for all who went. Thank you so much to Elaine, Fiona, Richard and Nigel who looked after the young people that weekend. 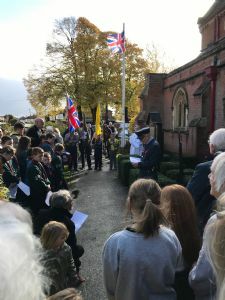 November – we made a change to our Remembrance Sunday arrangements and we began with a service all together in church, before heading outside for an act of remembrance at the war memorial at 11am. The church was full, and many people stayed for coffee afterwards. 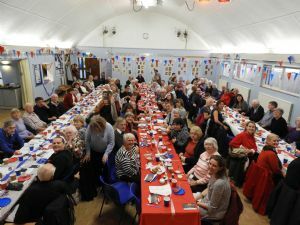 In the afternoon we held a special afternoon tea with a wartime songs sing-along. My thanks to Peter Duneclift for organising the entertainment side, it was excellent and thoroughly enjoyed by all. December – was dominated by all of our Christmas events. The Christmas workshop was excellent as ever (thank you so much Sheila and Elaine for organising it), the church was very full for the Christingle service afterwards with the premier outing of my inflatable suit! The St Ebba’s nativity was a joy as ever and I am so grateful to all the team who do so much there. Ian organised a great café church nativity, Gilly did an amazing job with the carol service and Amanda led a brilliant Christmas Eve family service. Carol singing at the club had a particularly big choir this year and was well led by Peter. 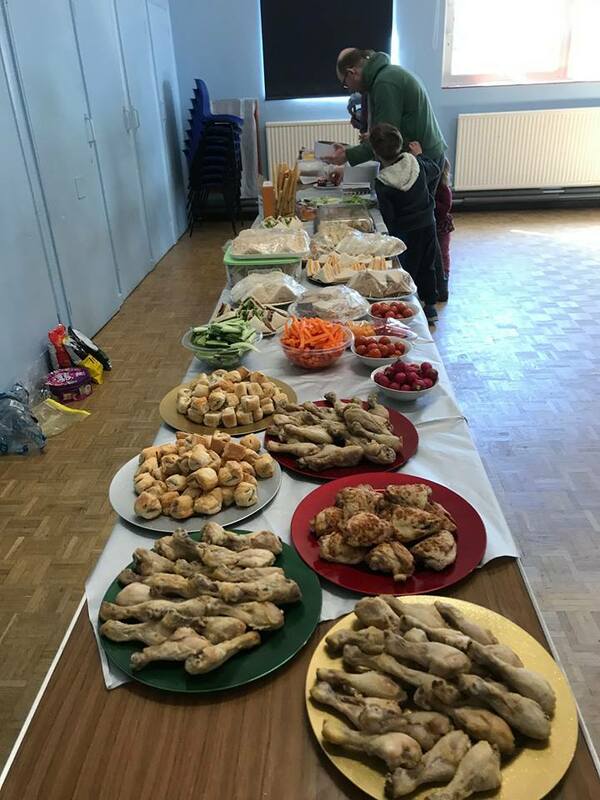 These were just the highlights – there was so much more happening too with school services, our quiet communion service, Toddler Time party and yet more as well!! Thank you so much to everyone who donated new toys and books for our appeal for the children's department at Epsom Hospital. They were all safely delivered this morning and the staff were thrilled - they literally clapped their hands with joy! This year we decided to do this instead of collecting shoeboxes as we have done in the past. 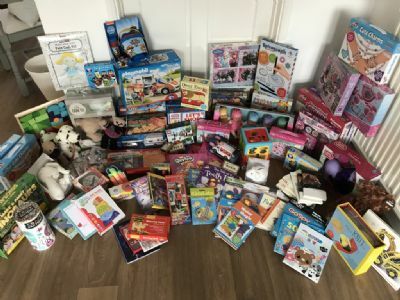 The hospital really needed new toys to give as gifts over Christmas and lots of craft supplies to use with children whilst they are in hospital. I was certainly able to deliver plenty of everything and felt very proud to be your Vicar whilst doing it. Once again this year the little ones at Toddler Time took part in fund-raising activities to raise money for this charity. We had great fun with a sponsored ‘sticking’ session and made Pudsey headbands. Also, families could go for a ‘Walk in the Park’ – we provided a map and questions to answer and the children had things to spot and collect. In total we raised £90.50 for Children in Need. Well done everyone. In this centenary year marking the end of the First World War, our church has really made an effort to recognise this important milestone. 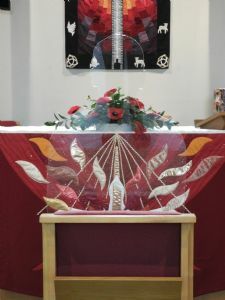 The excellent Remembrance Service and Community event had a huge impact on church members and local people. Our sterling work, over the years, to support the Poppy Appeal has resulted in year on year increases in the amount we have raised for the good work of the RBL. 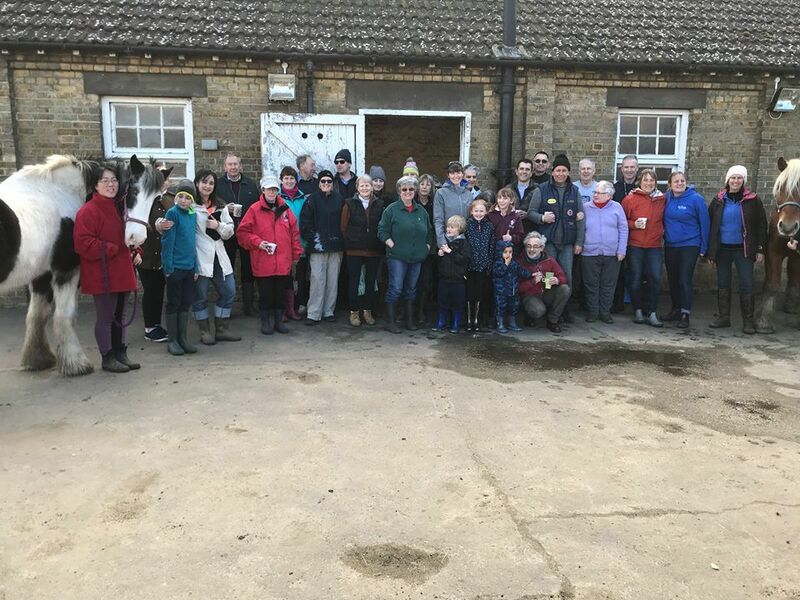 We expected this year to be good as people recognised the anniversary and we have also added more collecting opportunities, like Danetree & Blenheim Schools. Accordingly we have banked a total of £6008.08 which is £1883 more than we banked last year. This does not include the £675 that was raised at the Remembrance Day Service and afternoon event. Our heartfelt thanks go out to all those who volunteered to collect from door to door, stand in the draughty foyer at Homebase, delivered tins to shops and businesses or stood late into the evening at the Odeon Cinema, you are truly amazing, Well Done! We will be sending out individual Thank-You Cards to all collectors to let you know how well you did. We were delighted to be joined by so many visitors for our service on Sunday morning followed by our Act Of Remembrance. Gathering as a community to remember, to reflect, to pray and to commit ourselves to working for peace was significant and moving for us all. We really enjoyed having members of the uniformed organisations with us. 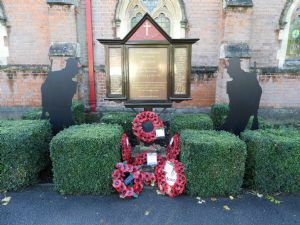 We are grateful to the Armed Forces Covenant Fund who supplied our silhouettes for inside the church and Andy Hayward who made the two Tommies for outside by our war memorial. In the afternoon we held a ’Sparkling Afternoon Tea’. 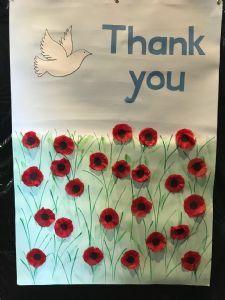 Songs from the time of WW1 were sung, poems were read and copies amounts of scones and cake were eaten and all washed down with plenty of tea and fizz! Thank you to those who entertained us, those who baked for us, those who helped set up and clear away and our young people who were fabulous hosts. The collection from the service and the tea meant that we have been able to write a cheque to the Royal British Legion for £675. Thank you to you all for joining with us. Here you can see some impressions from the Youth Weekend away; click here to see more photos via Facebook. We knew it was going to be a long 24 hours. We knew we needed to be focussed, resilient and to work as a team. We also knew it was a totally mad idea to cycle on static bikes for 24 hours and have a cake sale. Everything we do at All Saints seems to involve cake! 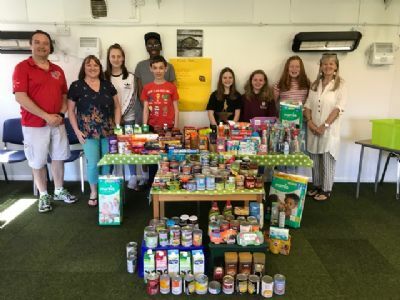 “Perhaps 12 hours is enough we said”; “Perhaps you could just do some car washing to raise funds for the weekend away in October?” But the Genesis group were adamant. They could do it, and they wanted to do it, so the Great All Saints Bike Off was born. When Andrew stood up in church and announced the event four Sundays ago, the reaction from church was overwhelming and the following Sunday when we began to ask for sponsorship for our weekend away in October and our soon to be launched Youth Café, we could see that we clearly had incredible support. 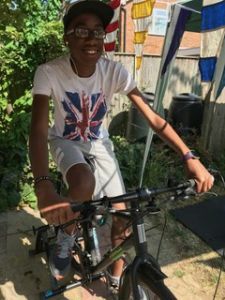 So, on Saturday 14th July at precisely 10 am we started to cycle on static bikes, under the gazebo on the meadow and continued until Sunday 15th July at 10 am. We decided to change cyclists every 20 mins as it was such a hot day and that’s how we did it – 72 slots of 20 mins with no breaks = 1440 minutes. It was so important that we complete the challenge properly, so one of the three bikes we were using was in motion the whole time. Sometimes the changeover of the cyclists was tricky, as we needed to have a second bike going for a few seconds so one rider could get off and another get on the same bike, so we maintained the objective of cycling continuously. Sometimes just one cyclist was in motion, but often a second cyclist would start just to offer a bit of support or have a chat. All through the day and evening we had visitors from church who came and spent time chatting with us and drinking tea and buying cakes. It felt like something bigger than just a sponsored event, it felt God driven. We laughed, we played games on the meadow, we ate lots, had a BBQ, watched films, chatted, saw Jupiter and the space station fly over (or maybe it was a satellite), said hello to a mother fox and her cub, prayed and some of us even slept. For 24 hours the meadow was our home and all the while the wheels on the bikes turned. When the sun came up on Sunday morning, we knew we were going to complete our challenge and Rev Sue got us a live interview on BBC Sussex and Surrey radio. Carried along by the support from everyone around us a very loud impromptu singalong began as the meadow began to fill ready for the service at 10am. Genesis may have looked like they had been up all night but they certainly didn’t sound like it! I will always remember the 24 hours I was lucky to spend with an amazing group of young people and a team of leaders who really care. Thank you to Pete, Freya, Nathan, Chris, Andrew, Lucy, Katie, William, Alicia and Robert. The total raised to date is over £750 and counting which will go towards our weekend away and youth café. Many thanks to everyone who supported our young people collecting donations for the local Foodbank on two Sundays in April & May. They received an amazing response! 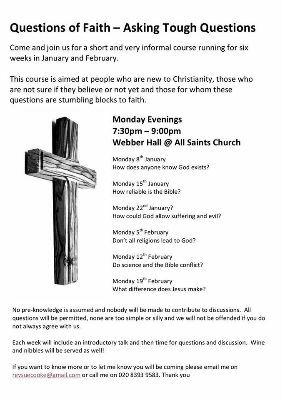 In January and February we run a course in which we discussed some of the big questions of Faith in an informal group setting. Over juice and wine, we had some lively discussions, ranging from Big Bang theory over personal experiences to Jesus' life. If you have missed the course but would like to know more, please contact Rev Sue Cooke for more information on future course or simply to discuss some of the these questions over a cup of tea. Hand-outs from the discussions are available upon request from rev Sue Cooke. Also - keep an eye on our website for more courses to come in the near future. Twice a year we put our faith into practise and get together for a big clean of the Church and the Halls. This is always a lot of fun and even includes Communion as well as Coffee and Tea and Cake. Thank you to all the Church family for the great turnout and the great enthusiasm with which we got together to work and to have some great conversations. More fun photos can be found here. Christmas always is a busy time and there were plenty of activities going on in the run-up to Christmas. If you'd like to see more photos, please click on the links below - this will bring you to our Facebook page photo albums.